I know it’s been a while since I last posted but this is going to be short and sweet. 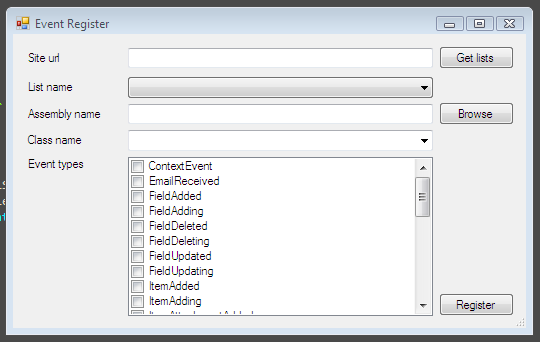 I’ve just been working on a SharePoint 2010 site where I’ve need to change the names of site content types and have the changes pushed down to a list that already uses the content types. The content types are deployed using a solution but that’s where the automation ends. However, this is where Powershell steps up to the mark. With Powershell we can quickly automate just about anything in SharePoint. Today I tried migrating a Visual Studio WPSBuilder project from one machine to another. The originating machine was 32bit Windows Server 2008 the destination machine was 32bit Windows Sever 2003 Standard. To migrate the project I simply zipped the solution folder and copied it across to the destination machine, unzipped and opened in Visual Studio. When Googling the the error message the only result was on the WSP Builder CodePlex site and was about 64bit versions of the Cablib.dll assembly. As neither of my machines is 64bit I figured this wasn’t the issue. Delete the wsp file in the project folder. After this everything was back to normal. When I first started developing with SharePoint in June last year the last thing that was on my mind was Enterprise Search. I had considered it the sort of technology that you just plug in a magic box and it just did all the work for you. Recently, however, I have been involved in developing a customised search solution using Microsoft Office SharePoint Server (MOSS) to allow a client to search client and non-client related documentation within their organisation. What I rapidly discovered is that enterprise search is not a plug-and-play affair. A lot of thought needs to go into the meta data that is used to define the taxonomy of the data (in this documents) and also how users are going to interact with search and how to make sure they get the information they need. I have also recently been on a training course at FAST Search,which was acquired by Microsoft in April 2008. The course was both an introduction to the structure of FAST ESP and also an in-depth look into customising the internal, both feeding content into the indexing engine of FAST ESP and building a rich user experience for getting content from the FATS ESP search engine. The two activities have really awaken me to how powerfull enterprise search can be in empowering users to find information which previously they either may not have know how to access or, more likely, simply hadn’t known existed. Whilst I was learning about FAST Search, it was generally anticipated that it would be included with the next generation of MOSS. Today that was confirmed at FASTForward ’09 when Microsoft announced its roadmap for enterprise search which has two initial streams, firstly FAST Search for Internet Business which is mainly aimed at internet retail businesses – like you’d use to find products on Amazon. The second, and more interesting for me, stream is FAST Search for SharePoint, which will integrate FAST Search more closely with SharePoint and would be used for the type of internal information discovery that I have been working on recently. a special offering that allows customers to purchase high-end search capabilities today, with a defined licensing path to FAST Search for SharePoint when it becomes available. I haven’t been able to find out more information about ESP for SharePoint, but it certainly looks like it could be an interesting product to get hold of. I the mean time I’m keen to continue working with MOSS Enterprise Search and have just the right project lined up to flex my new found love of search on. I have just leant the hard way that you should always check the name you have given your feature before deploying it to a server. Quite stupidly I created several features, at least two of which I now know conflicted with existing SharePoint features. I used the xcopy method of deploying the feature on my local dev machine with the “/Y�? switch to suppress prompts when over-writing existing files, so at the time I didn’t realise what I had done. It was only when I can to create a new site collection that everything call falling down. I’m currently downloading the SharePoint installation DVD from Microsoft in the hopes that a re-install will fix the problems. It will greatly reduce the risk of a feature name conflict. It will group all the directories together in explorer for easier deletion. One of the things I’m working on is Event Receivers in SharePoint but I’ve found registering the event receivers to be a bit on the annoying side. Yes you can do it with the feature.xml Receivers section and there is the great El Blanco Event Receivers Manager. I personally prefer desktop GUI applications and so, based on code by Liron, I’ve created my own desktop Event Receiver Manager. It allows you to select site & list, browse for an assembly so it can give you the full assembly name and a list of classes inside, and a list of receivers you can attach to. The current version only allows adding new event receivers. Before adding a new receiver it will check to make sure the same receiver doesn’t already exist. Future plans for it include listing existing receivers to allow users to delete them but as I don’t need to do that myself yet I haven’t implemented it. 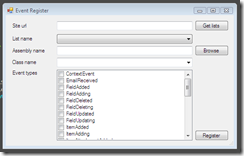 Download a copy of EventReceiverManager. These are same as for lists and libraries but information is stored in XmlDocument section of feature. e.g. migrating files from other systems.